Amish wood furniture is not only stunning, but sturdy enough to withstand the tests of time. What makes the wooden furniture made by our Amish craftsmen is the high standard of construction and choice of only the best materials. Every piece of wood furniture is made to order from all-natural American hardwoods. You can pick your own style, wood and finish for any piece of Amish-made, quality furniture you order through us. Our craftsmen don’t work in a factory. Instead, they build our wooden furniture in workshops at their homes in Amish communities throughout Ohio. There are no electric tools. Sawing, sanding, dovetailing and fitting are all done expertly by the hands of master woodworkers who are hard at work long before most of us even consider getting out of bed. It’s not uncommon for three generations of an Amish family to work side-by-side in the creation of custom furniture that is of such excellent quality, it will be an heirloom that you, too, pass down through the generations. 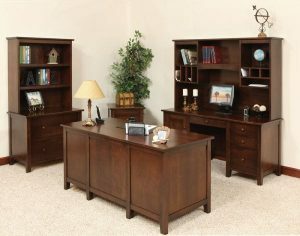 Our Amish craftsmen build a variety of wood furniture for your home and office. You can order custom living room and dining room furniture, home theater and kids’ furniture, outdoor wood furniture, as well as beautifully crafted office and bedroom furniture and other types for your home and business. And when you order your custom furniture from us, you also have a choice of what type of finish you want: lacquer, which is the most common furniture finish, or conversion varnish, which offers superior protection against moisture damage, as well as damage from nail polish remover, tape, mustard, ketchup and other common stains. Conversion varnish will give your Amish wood furniture the best protection, and it can be easily cleaned with a soft damp cloth. Though not all wood varieties are available for every piece of our Amish wood furniture, varieties of hardwoods that can be used include oak, cherry, brown maple, white elm, rustic cherry, hard maple, walnut, quarter son white oak, and hickory. To find out more about what hardwoods are available for specific furniture types, simply contact us online, call or stop by our store in Columbus, Ohio to look at samples. To get your furniture, all you need to do is browse our website to see what we have available. You can create a wish list, print it and bring it into the store, and we’ll help you find what you’re looking for. If you have questions, feel free to use the contact form on this site or simply call us at 614-891-6257. We also invite you to come into the store to have a look around, and we’ll be happy to answer any questions you may have. To find out more about Amish wood furniture, how it’s made, what we have in stock, and special deals we may run from time to time, be sure to sign up for our newsletter using the form provided!